for your Mac users. What's new. Unmistakably Office. 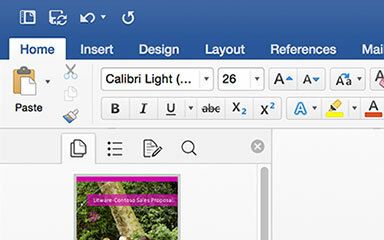 Microsoft Office 2016 for Mac features a redesigned Ribbon menu similar to the Windows and iPad® versions. You can navigate your Word, Excel and PowerPoint files with familiar Mac OS Multi-Touch gestures. And it's all sharper and clearer than ever on your Retina display.. Your best work anywhere, any time. Access your documents whenever you need them, with Microsoft OneDrive for Business, Microsoft SharePoint and Dropbox for Business integration. Use state-of-the-art tools to create great-looking documents, analyse data and present with confidence. Microsoft Office 2016 for Mac features a redesigned Ribbon menu similar to the Windows and iPad® versions. You can navigate your Word, Excel and PowerPoint files with familiar Mac OS Multi-Touch gestures. And it's all sharper and clearer than ever on your Retina display. 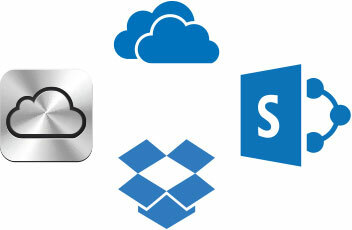 Access your documents whenever you need them, with Microsoft OneDrive for Business, Microsoft SharePoint and Dropbox for Business integration. Use state-of-the-art tools to create great-looking documents, analyse data and present with confidence. No more sending attachments back and forth via email. Easily share your files with others, and then edit them simultaneously in Word, PowerPoint or OneNote. 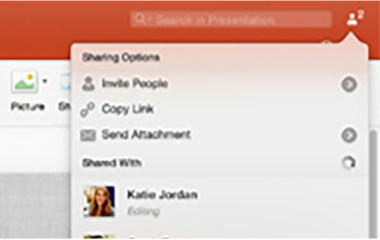 Plus, Office preserves your content and formatting across all devices for seamless collaboration. Make your Mac users more productive with Office 2016 for Mac. Office works great across multiple devices and platforms, and it's included in your Office 365 subscription. So let them know that the new version is available to install with our ready-to-send email.